Another cool, blustery spring day makes one wonder when the “normal” temps are going to start for this year! Many perennials are getting off to a slow start but the cool weather hasn’t hindered my apple espalier (pronounced es-PAL-yay) one bit. The Fuji apple tree has doubled, maybe tripled its blossoms this year making a pledge to provide some tasty red jewels come Fall. I hadn’t noticed the multitude of pink-fringed white fluffy blossoms on my Fuji tree but today they were brilliant under the overcast sky. 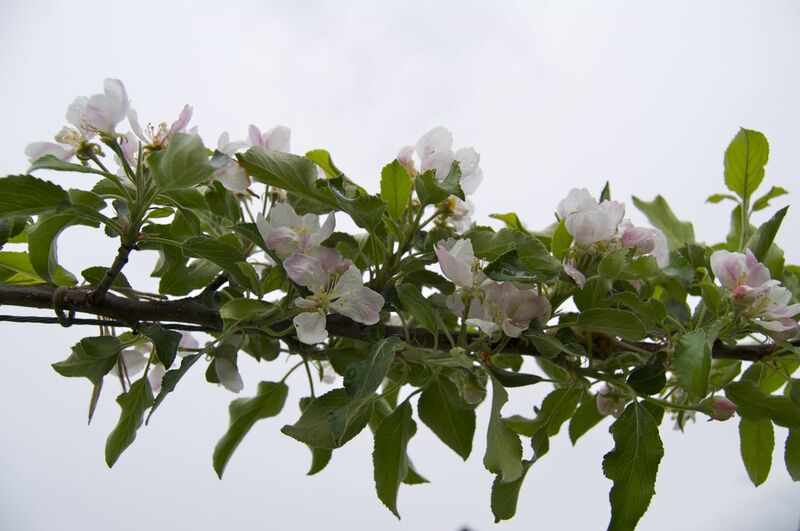 I also have a Gala apple espalier and its blossoms are notable but not like the Fuji. I suppose this is to be expected though as the Gala tree is in its second growing season in my garden and the Fuji in its third. I have always been fascinated with the art of espalier – the ancient European method of growing a tree, shrub or vine on a flat plane. I’ve always wanted to utilize it for growing fruit and last year ‘the builder’ and I constructed our first one. 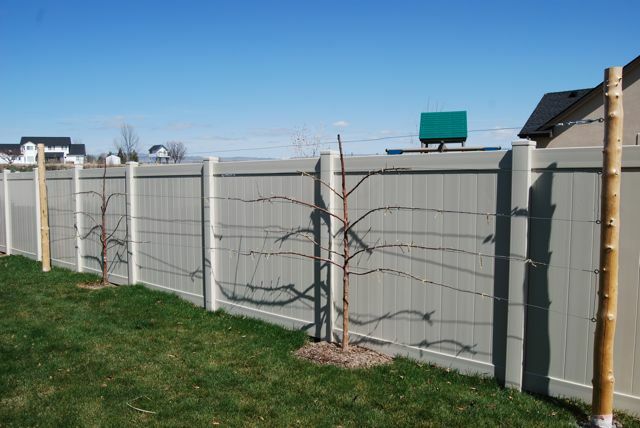 We planted two cross pollinating apple trees (Fuji and Gala) in a sunny location just in front (six inches or so) of a very bland stretch of vinyl fence. We (I mean, he) constructed a free-standing structure (primarily of pine logs, light-weight cable, turnbuckles and eye bolts) also in front of the fence and parallel with the trees. We chose a simple espalier form (horizontal cordon) and started training the semi-dwarf trees along the structure in the desired design. At first it looked a little strange as we had to “mold” the trees existing branches to the framework. In fact, one visitor said, “What are you doing to those poor trees, they look crucified!” But over the season the mature branches conformed to the pattern and we easily trained the new branches to become part of the design. 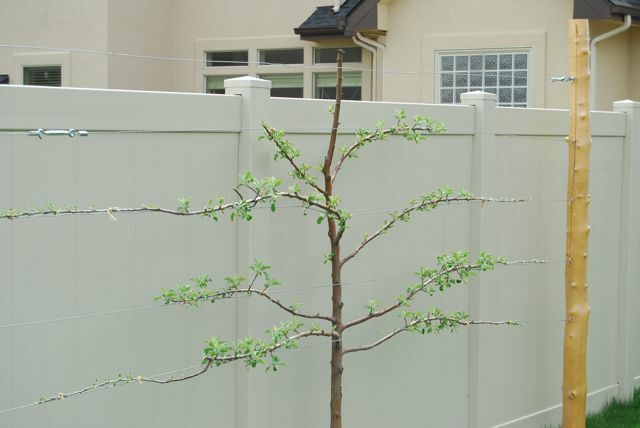 If you have a small outdoor space, espalier is definitely the ideal way to grow fruit in your backyard. 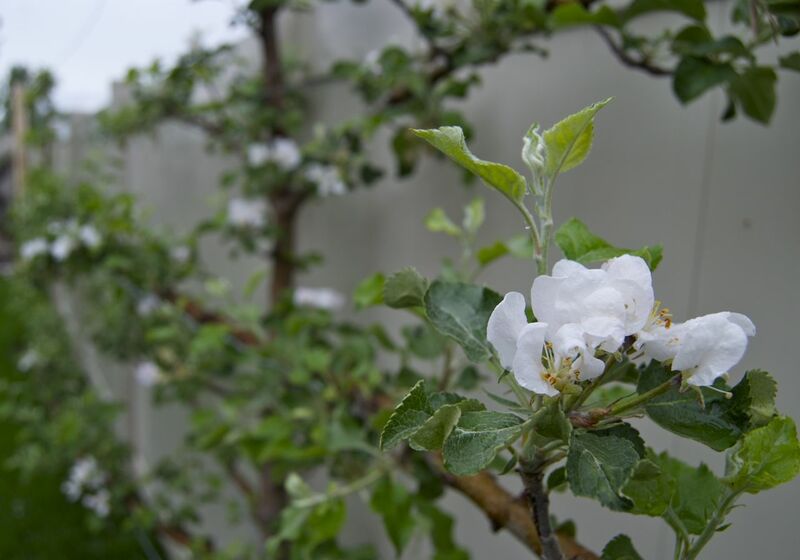 Once mature, espalier trees can produce more fruit than traditionally grown trees and because they are less susceptible to breaking branches they have an incredible life span with some reports of trees being 150 years old and still producing fruit! 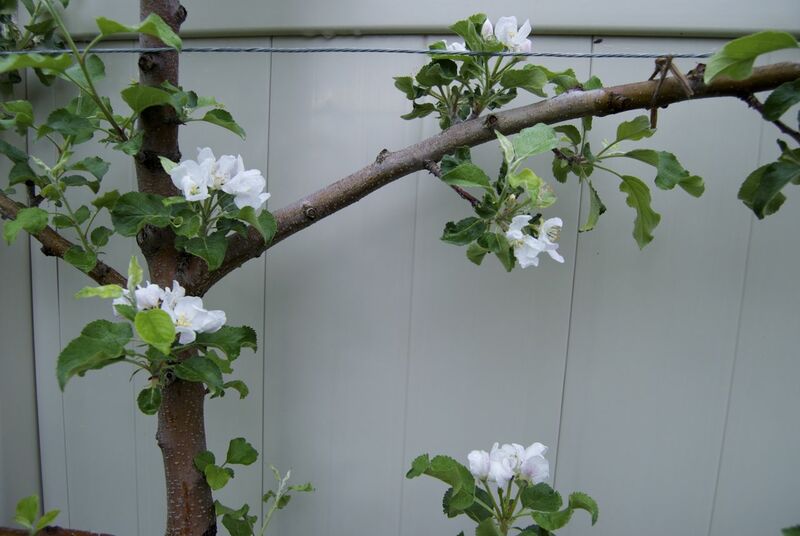 For home gardeners that want to grow fruit trees, I would say espalier is the best way and it can make your day! 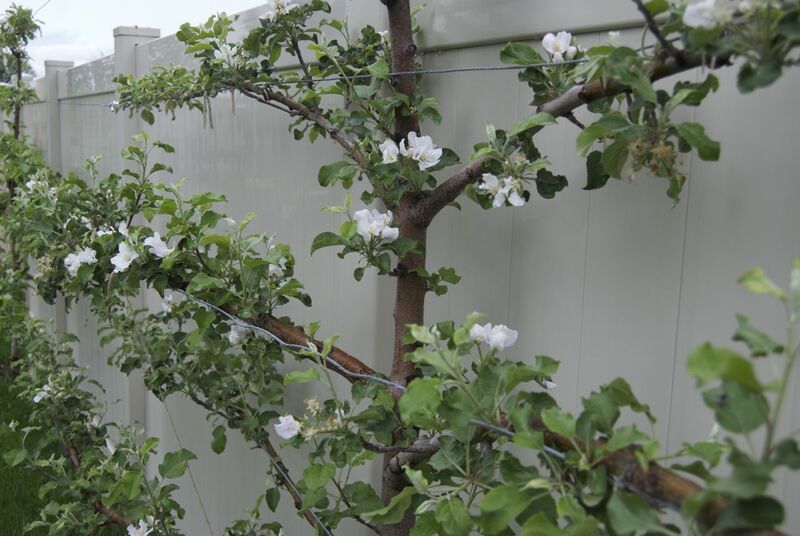 Here are a couple of short videos on how to set up a structure to espalier a fruit tree and how and when to prune your espalier trees. What a fine post! We have been thinking about growing apples this way, but we were not sure how to do it. This will help. Welcome to Blotanical! I would have to agree based on those pictures of the earlier stages!? Ahh, but a homemade apple pie might be in the works for this Thanksgiving! I am SUCH a fan of this method! I so want to get an apple tree to do this on. I read so much about it. Cool to see you doing it! So now all I have to do is make a trip to your house for some apples in the fall! Yes, you would be welcome and hopefully we’ll be serving up some yummy apple pie! First of all, what beautiful trees you have! I just recently read that fuji and granny smith apples (the two varieties I planted and started training into cordons last year) are both tip-bearing apple trees. I am worried. When all of my cordons have reached the length I want I will have to cut them back to keep them at the length I want. When I do this I will be cutting off the tips. If the trees fruit on the tips, will I get any fruit? I am new to fruit trees and I would appreciate any information or advice you have. Thank you!!! Do you have to leave the support structure up at all times? What I mean is, is there a time in which you can remove the support and the tree will continue to grow in that way on it’s own? Hello! You must always leave the support system as the tree will start growing upright without the training system. You must also trim espaliers a couple of times during the growing season for the tree to keep the form. Hope that helps.